This is the impressive successor to the VW Golf Plus and though it’s called the Sportsvan for its launch, VW say that won’t be its actual name when it reaches these shores next year. 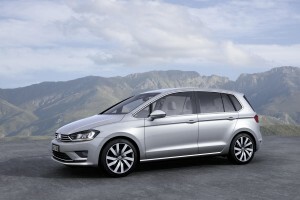 That’s just as well since the VW Golf Sportsvan is not actually a van and makes its debut at the Frankfurt Motor Show. It will be built on the new MQB platform and have a whole range of new technologies. Lovers of the VW Golf Plus will be impressed with the new VW Golf Sportvan when it hits the showrooms since it has a versatile rear seating system which allows full optimisation of leg- and luggage-space. But essentially, the new vehicle is based on the multi-award-winning Golf hatchback and is simply a larger version of that vehicle. Although it has a more practical body style, it will look closely-related to the VW Golf design we all recognise. The new vehicle is also slightly longer than the current VW Golf Plus which, in turn, is much longer than the current VW Golf and it’s wider too. The new VW Golf has a boot size of 380 litres while the new Sportsvan will offer nearly 500 litres and with its rear seats pushed forward, the boot size increases to an impressive 585 litres. Much like the current VW Golf line-up, you will have a vehicle which has a stronger, safer body structure with new standard active safety systems including automatic post-collision braking system (which in theory reduces the chance of a second impact) and a pre-crash system which detects the potential of an accident so it will pretension the seatbelts and close the windows and sunroof to help increase protection from the car’s airbags. VW is also adding adaptive cruise control, front assist and city emergency braking as well as their impressive Driver Alert System and a camera-operated Lane Assist system. Among the firsts for the VW Golf Sportsvan is a Blind Spot Monitor which will also help when leaving parking spaces by monitoring the area behind and to the sides of the vehicle. This new VW Golf Sportsvan will come with the usual selection of petrol and diesel engines which will all conform to Euro 6 emissions standards and incorporate Stop/Start and battery regeneration systems. As you would expect, VW is also adding the option of a Sportsvan BlueMotion, which should return fuel economy of 76.3 mpg and emit 95 g/km of CO2. For the size of the vehicle, these are very impressive fuel economy figures and underline how impressive VW’s BlueMotion technology really is. Set to go on sale in the middle of 2014, VW says it will announce the vehicle’s real name nearer to the time of its launch. This entry was posted in Car Leasing, Cars, Family Car, New Cars and tagged VW bluemotion, vw golf, VW golf sportsvan by Steve Lumley. Bookmark the permalink.